I proudly present the talented Philip Dickinson and his historical novel set in Tenochtitlan, another lesser known setting for me and a great read for more than one reason. Drought has taken a terrible toll on the Aztec capital Tenochtitlan, but worse is still to come. It is the final days of the sacred calendar and the New Fire must be lit, to appease the gods and keep an apocalypse at bay. Meanwhile, war and dark politics are at work. The high priest hatches a devious plot to undermine Tlacaelel, the ruler’s brother, and break the stranglehold of the burgeoning secular state. Tlacaelel has other worries on his mind. The empire needs to expand into the lush and fertile coastal lands to feed its starving people, but Chalco, the Mexica’s rival state stands in the way. 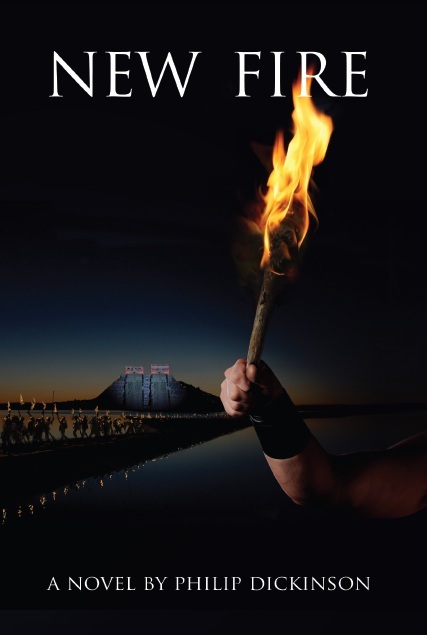 As the crucial battle looms, Tlacaelel must persuade his brother Moctezuma and the Great Council to sanction a new and bloody kind of war against Chalco, one that puts victory and the lives of his warriors above the relentless hunger of the gods. 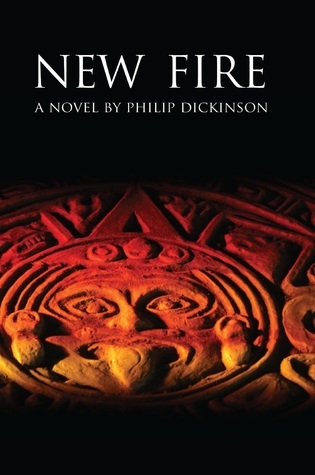 “New Fire” by Philip Dickinson is an amazing achievement in historical fiction about a time and a culture that is hugely neglected in history lessons in both Europe and America, a rich culture before colonization. Dickinson describes in rich detail the society of 15th century Mexico, its tribal structure, the power struggles between the clans and the priesthood, the astrologers, the rituals of human sacrifice, the life of the warriors, games and many more aspects of the life of the people that will later become the Aztecs. The story revolves around two young men and their friendship as it is caught up in tribal warfare, honour and the preparations for the ceremony of the New Fire, an important and rare event. This is a fascinating and great read, at times maybe overpopulated with characters, but educational without neglecting storyline and entertainment.I am very pleased I came across this book as it taught me a lot about that period of time and illustrated the culture in a very convincing and colourful manner. The writing is tight and smooth and the characters interesting and believable. I want to thank the author for taking so much time in carefully constructing this novel and bringing this almost forgotten culture into my life. My parents taught me the love of books and I’ve always read a lot. What appealed to me about writing was that ability to paint vivid pictures in people’s heads. It’s an extraordinary power, a bit like telepathy. What was your connection to history and the ‘Aztecs’? I took a book about the Mayan civilisation on holiday with me. It was unlike anything I’ve ever read before and I went straight to the library when I got home to borrow a book about the Aztecs. Both peoples were complex; advanced in many ways but incredibly barbaric too. It was when I was reading about the sacrifices that the Aztecs had to carry out to keep their gods appeased. I wondered if it would be possible to tell a story that a modern reader would find believable. It is part of a series. Where is the story going from here? Do you know already? How many instalments are you planning? I have three distinct stories in my head that are set in 1455, 1460 and 1468 respectively against a backdrop of real events. I have a rough idea of where it’s going, but one of the wonderful things about writing is that it often has the power to surprise the author. I began it in 1996 and tried, unsuccessfully to get it published. After a couple of drafts, I put it away to concentrate on my career and raising a family. In the meantime, the publishing industry had undergone a revolution so when I began the final big rework in 2010, I knew I could connect with some readers, even if I couldn’t go the traditional route. I borrowed books from the library and invested in my own copies too. Most of my research was done this way because there was very little on the internet when I started the project. I filled a notebook with facts and ideas. History has such a lot to offer us. I didn’t realise that when it was being taught at school. We seem to have forgotten that the biggest and most fundamental advances that humans made were done hundreds of years in the past, and some of them thousands of years ago. So it seems natural to weave a tale into the rich tapestry we already have. I have a full time job in London and a young family so just about the only time that is my own is when I’m commuting, on the train. The environment isn’t great for writing. Sometimes it’s impossible because I don’t get a seat, but once my imagination locks in to the story, everything around me ceases to exist. Probably three comprehensive rewrites, but some areas got more attention than others! As it’s the first book I’ve written, just about everything about it was incredibly hard! Finding the time and determination to keep going, no matter what. Specifically what I always find tough is writing characters; you know, bringing people to life on the page. I sometimes wonder what the story would have been like if I’d had an editor. Shorter, I guess!  I am lucky in having a great proof-reader, Laura, from Editorial Stand because my punctuation is atrocious! My publisher, Grosvenor House Publishing put us in touch. Wow, I could fill a lot of space talking about favourite books and authors! I love Joe Abercrombie for his dark fantasy fiction and characters so grim they stain the pages that describe them. I am drawn to the darker stories in science fiction too. I loved Richard Morgan’s earlier works and Alistair Reynolds paints a rich canvas across the vastness of space. Ah well, I don’t know many people of indigenous Mexican origin, but I’d love Raoul Trujllio (Apocalypto) to play one of the warriors and then pretty much any of the cast of that film. Thanks for sharing another new author. The Azec culture is so interesting. I’ve added New Fire to my TBR list. Christoph, thanks so much for featuring my novel on your blog. I hope your readers enjoy it. I’m happy to try and answer more questions if any arise. Thanks for bringing a forgotten or lesser known era back to life and to my attention. I know my readers will enjoy it. Christoph, thank you for this interview. I love the way he describes writing as a type of telepathy…that is kind of how I look at it as well. I am also fond of the line, “…so grim they stain the pages that describe them.”…what a great quote! But I guess the best compliment i can tell you is, as a result of your post…I’m off to buy the book. Thanks Stephen, I loved that passage about writing as well. Enjoy the book, it is a real treat. I hope we do not have to wait long for the next book in the series. Stephen, I really hope you enjoy ‘New Fire’. I want to transport my readers to the time and place of my story so that they see, hear and smell the place as it would have been. I hope you find the experience is ‘immersive’. Paulette you will enjoy this, I am sure. As a writer of such great historical fiction yourself You’ll appreciate how much research and thought has gone into this book!